On Tuesday, May 23, 2017, The Terrace hosted a diverse group of people to talk about plastic waste and the circular economy. The evening kicked off with an interview with Leontine Gast, founder of The Terrace, followed by a roundtable discussion on plastic waste in our lives, led by Nelmara Arbex, CEO of Arbex & Company. Leontine Gast is an expert on bringing purpose to business. 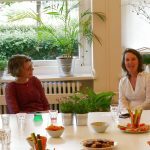 At this event, she was interviewed by her colleague Marjolein Baghuis. Leontine has worked in sustainability for over two decades, including ten years as the founder and managing director of The Terrace, the agency for positive change. She has contributed to a more circular economy through her work with companies and other types of organizations. Her top tips from that experience regarding plastic waste target both users and producers of products that contain plastics. Consumers need to be much more aware; once they really understand what they are buying, they will make different choices. Producers need to continue to pioneer solutions and share their learnings. Not just solutions related to waste streams, but also as early as product design; i.e. with design for disassembly such as Ahrend’s vision on office furniture. For the years ahead, one of Leontine’s dreams is that we’ll find a way to consume and produce less stuff – and better stuff – including a reduction in the amount of plastic we create. Other dreams include the transition to renewable energy and a switch to a more plant-based diet. Influencing peers to start recycling plastic. Can biodegradable plastics be recycled with other plastics? No, please put them with your organic waste. How much plastic is recycled in our city (Amsterdam) and what actually happens to it? Amsterdam’s citizens collect only 8% of plastics separately. After sorting, cleaning, and shredding, recycled plastic are turned into new products like fleece sweaters, toys, furniture, and pipes. Why are the ingredients for food and clothing spelled out in detail, but those for packaging nowhere to be found? Where can I buy groceries without superfluous plastic packaging? How to balance food waste with plastic packaging to keep it fresh longer? Involve celebrities to make it aspirational to turn your back on today’s throwaway culture. It was great to meet like-minded people at this event. All with a strong belief that we can have an impact, each with a strong personal motivation to create positive change! 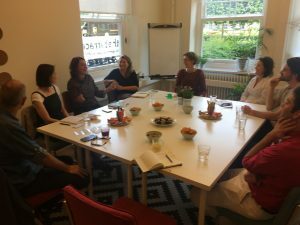 This blog was written by Marjolein Baghuis (@MBaghuis) to share the outcome of the roundtable discussion on the OpenIDEO platform. It also appears on the website of The Terrace. To read about interesting people, book reviews and other posts about sustainability, change, and communications please subscribe to the Change in Context blog.